The best TV theme songs can bring back a flood of memories. Remember when you waited for the appointed hour to watch your favorite show? After a slew of commercials, suddenly, the theme song was playing and it was your cue to begin watching in earnest. If you weren’t singing word-by-word, you were usually at least humming along. Well, we went back a bit and listened to a whole bunch of themes songs. We selected our favorites based on music quality, originality and fit to the visual aspects of the program and specifically, the opening. And so, we selected our best of the best. Enjoy! Here are our top favorites of all time. And, let me just say, there were some tough decisions to be made. Was there something that made you come back again. Yeah we tease him a lot ’cause we got him on the spot. Rivers was born John Henry Ramistella of Italian ancestry. Born in NYC, he along with his family moved to Baton Rouge. An agent convinced him to change his name to “Rivers” after the Mississippi which flows through Baton Rough. To everyone he meets he stays a stranger. Odds are he won’t live to see tomorrow. Secret agent man, secret agent man. They’ve given you a number, I know they’ve take away your name. Odds are you won’t live to see tomorrow. They’ve given you a number, oh they’ve taken away your name. And then layin’ in the Bombay alley next day. They’ve given you a number, oh they’ve take away your name. Jose Feliciano’s theme song is a classic. The show starred Freddie Prinze as Chico and Jack Albertson as the man. The Man he ain’t so hard to understand. Guess who’ll be standing there? Come and watch us sing and play. Written and performed by Harry Nilsson – of “Everybody’s Talkin” and “Me and My Arrow” fame – the song was played over the opening credits which usually featured the father and son in a touching moment. Yeah he’s my best friend. This show featured the hijinks of a radio station played from 1978 to 1982. Sung by Steve Carlisle, the song was written by the show’s creator Hugh Wilson and composed by Tom Wells. A single of this TV theme song charted at #65 in 1981. I’m living on the air in Cincinnati, Cincinnati, WKRP. I’m at WKRP in Cincinnati. Written by DJ Jazzy Jeff & The Fresh Prince (Will Smith), this song became an instant classic. And all shootin some b-ball outside of the school. She said ‘You’re movin’ with your auntie and uncle in Bel Air’. But she packed my suit case and sent me on my way. Well, the plane landed and when I came out. So I sprang with the quickness like lightning, disappeared. But I thought ‘Nah, forget it’ – ‘Yo, homes to Bel Air’. The show lasted 11 seasons, one of the longest running comedies on TV, and featured George and Louise Jefferson who just moved from Queens to Manhattan. A spin-off of “All in the Family,” George had been neighbors of Edith and Archie Bunker. The theme song was written by Ja’net Dubois and Jeff Barry and performed by Dubois and a gospel choir. Dubois played Willona Woods on Good Times – Dynomite! Beginning in the second season of the show, the theme song was sung by the Ron Hicklin Singers. There were also the singers behind the Partridge Family TV show. “Who can turn the world round with her smile?” Mary could, and she did. Performed by the Rembrandt’s as the Friends’ cast played in the fountain. Didn’t this song make you feel just a little better? This song peaked at #5 on the Billboard Hot 100 in 1976. Written by Norman Gimbel and Charles Fox, Target stores ultimately licensed the song for an ad campaign in 2014. An updated version of “Rock Around the Clock” was also incorporated into the opening song. Saturday morning was filled with some real gems for theme songs. Check these out and let us know what you think. How great do the graphics go along with this song? Pretty spectacularly! “His son Elroy…Daughter Judy…Jane his Wife” was a great introduction to George’s family. Has there ever been a more lovable TV dog than Scooby? It was a right of passage to learn all the lyrics to this song if you were a child in the 60s. You have to love everything about this show and song! Better than the average TV theme song! Henry Mancini composed this classic. Theme songs that outlined the plot were helpful, especially in the early stages of a show. For anyone under 12 years of age, the playing of the theme song, was your opportunity to sing along. “Let me tell you a story about a man named Jed…” began one of the most memorable TV theme songs of all time. Eva Gabor and Eddie Albert belt out this favorite. Edith’s singing seems to make this song even better. “The Adams Family started when Uncle Fester farted” are not the true lyrics. I was greatly misled by my older brother. If every phone had this for a ring tone, the world would be a better place. Short, but oh so good. I like how in the older seasons, Rob learns to walk around the hassock that’s tripping him. There are also words to this song, but the TV show kept it instrumental. The theme song made you want to suit up for the good guys. When Maxwell Smart started talking into his shoe, it made Charades that much easier. My daughters voted this into the top list. So, how did we do? Are these the best TV theme songs? What song would you add? What did we miss? 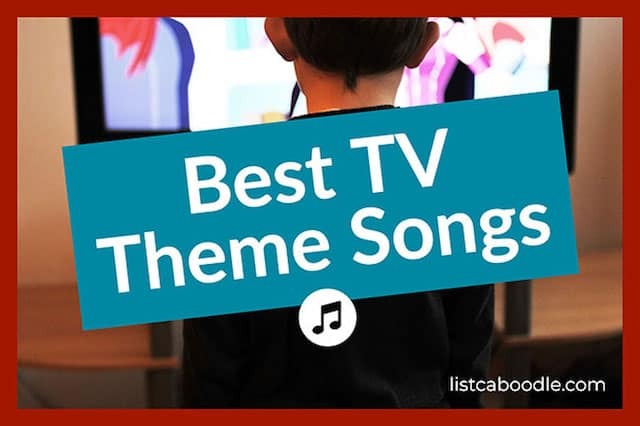 You’re on Best TV Show Theme Songs.